Beautiful Incentives: The Smushion Cushion Review & Giveaway! The Smushion Cushion Review & Giveaway! I suffer from chronic pain in more than one spot, like many people do. Anything that helps me feel more comfortable, I'm all over. The Smushion Cushion is one of those things. I had to have it for review. I saw lots of lovely things on Plow & Hearth, but I was set on this beautiful product. So simple of an idea, yet so amazing in execution. I have an iron and granite coffee table. I didn't pick it out, it was handed down to me. I would have never picked it out, because it is the most painful thing to rest your legs on. I hate the design and really need to have it replaced eventually. 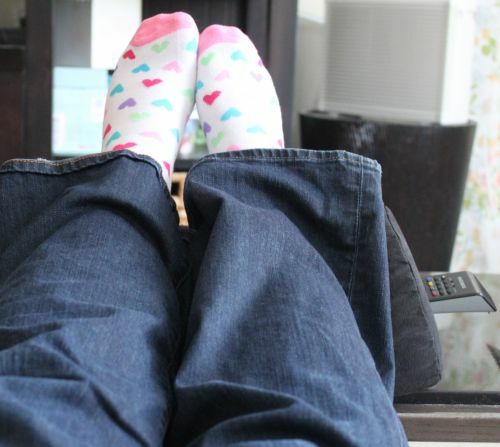 For now, the Smushion Cushion has made it comfortable to put my feet up again. It keeps my forelegs and ankles from being dug into by the pointy marble and metal top and edge. My feet and legs sink into it like a dream. The stock pic is a bit deceiving, as you do sink in a lot more than the pic conveys. Below is a more accurate display. The Smushion Cushion is unique in that it's no ordinary pillow. 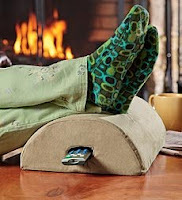 This pillow slash portable ottoman is made of memory foam and very thick. You feel nothing between you and this when you are using it. What's also unique is that it has a remote control holder as you can see in the pic.Do you see that uncomfortable metal edge I was talking about? The Smushion Cushion has many uses. It gets better though. How? It's machine washable! Just unzip the pillow from it's case. There are few things better than an easily cleaned product that you use a lot and thus get dirty a lot. I am in love with this product in every way and highly recommend you get one for yourself ! It's well worth it's $29.95 price tag. To find more great products on Plow & Hearth, visit their website and Facebook. I'm excited to say that I get to give you a chance to win one of your own right now as part of my Valentines Day "I love me" pampering event! 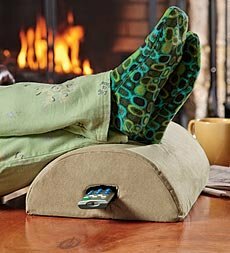 I think this would be great for my legs and back. I love that the cover is washable! I like the idea of using it for a book prop! I totally need this for my laptop. I just sit it on the arm of the couch.